Over the years the Sinn U1 has become our best selling Sinn watch of all time. It's tough, durable and great for both water diving and desk diving! But one feature that the standard Sinn U1 does not offer is a fully Tegimented case (the standard Sinn U1 features only a Tegimented bezel). Because the Tegiment process does such a great job of protecting the watch against scratches and other abrasions, we periodically ask Sinn to produce a limited run of fully Tegimented U1-T watches for us, and new pieces are now in stock. Please note that this watch does not replace the standard Sinn U1; it is simply a variant of that model that extends the Tegimenting protection for those who have requested this feature. The Sinn U1-T features the same great case design made in-house from German submarine steel at Sinn's case making facility in Glashutte, Germany. Once the case is complete, the Tegimenting process begins, and when we say "fully Tegimented" we mean what we say - case, crown, bezel, case back, the strap buckle and even the anti-reflective coating. The combination of the submarine steel and fully Tegimented case create superior scratch and corrosion resistance - in fact the case is up to eight times harder than standard stainless steel watch cases. And unlike watches made in stainless steel, this watch does not need to be rinsed with tap water with each exposure to a salt water environment. In summary, the Sinn U1-T is one tough watch that is designed to both last and look great over time. 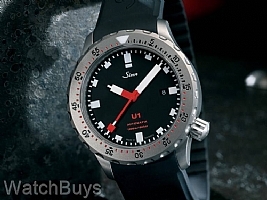 The Sinn U1-T case is made from the same steel that is also used in the construction of the outer hull of submarines. The steel was procured by Sinn from a steel supplier to Emden GmbH, one of Germanys North Sea shipbuilding yards who construct submarines from the very same steel. Because of the special steel used from the submarine steel manufacturer, the case resists the effects of exposure to salt water and salt water environments. And the fully Tegimented finish protects the case from scratches and abrasions by actually hardening the steel. The uni-directional ratchet operated rotating bezel is also milled from this submarine steel and is Tegimented. The indices are machined directly into the bezel without the use of bezel inserts, which can corrode or come loose at deep depths. The international testing lab of Germanischen Lloyd has tested the Sinn U1-T, and determined that the watch can be certified as water resistant to 1,000 meters. This same firm tests submarines for their ability to withstand the effects of underwater use. Matte black dial with date at 3, Super Luminova on hands and markers, and striking red seconds hand complete the design. Other features include sapphire crystal with anti-reflective coating, and rubber strap with steel buckle which is hardened using the Tegiment process.